Have a question for Wing Hotel Kualanamu? Nestled in the heart of Medan Tembung, Wing Hotel Kualanamu is an ideal spot from which to discover Medan. From here, guests can enjoy easy access to all that the lively city has to offer. With its convenient location, the hotel offers easy access to the city's must-see destinations. At Wing Hotel Kualanamu, the excellent service and superior facilities make for an unforgettable stay. This hotel offers numerous on-site facilities to satisfy even the most discerning guest. Experience high quality room facilities during your stay here. Some rooms include television LCD/plasma screen, clothes rack, complimentary instant coffee, complimentary tea, linens, provided to help guests recharge after a long day. Besides, the hotel's host of recreational offerings ensures you have plenty to do during your stay. 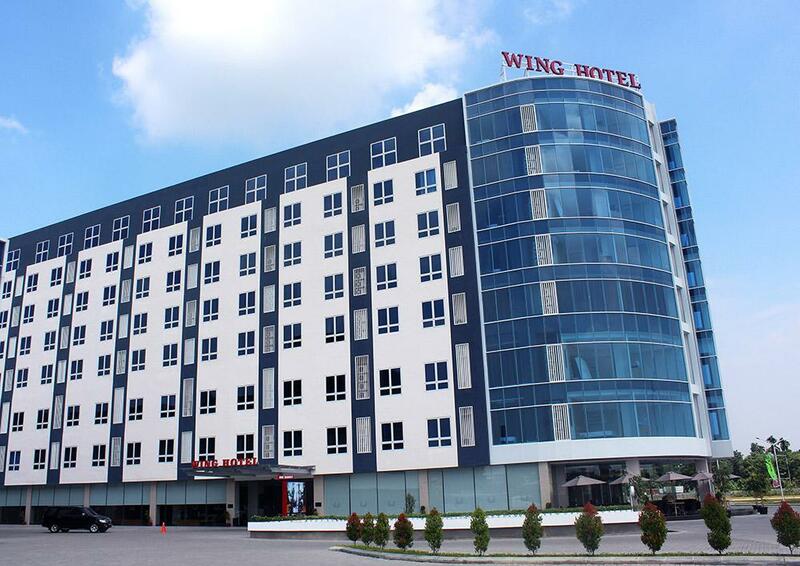 Whatever your purpose of visit, Wing Hotel Kualanamu is an excellent choice for your stay in Medan. Pro - room service menu has been improved but a bit expensive. Con - water always clogging near the toilet bowl due to poor drainage,most of the rooms, never improved on this matter, since i always stay here since 2016.. Pro - The room was big and clean,satisfy with my stay. Cons- Wifi were very BAD during my 2 nights stay 9-11 jan 2019. Had asked many times to check the connectivity of the wifi level 6,but were told by the staff "we will TRY to settle it, but still very poor connection. Foods for breakfirst and to room request had not been change since I stayed in the year 2017 till early 2019, same menus. Luckly Paparich restaurent is located in the hotel. The management should have improvise the menu's and have a good impression by visitors about the food served at the hotel. Sebenarnya saya hanya nginap 1 malam sama anak saya tgl 1 Jan 2019, pulang dari Parapat, karena mengejar pesawat jam 07 pagi e JKT, jadi lebih baik menginap di hotel area bandara KNO. Kondisi kamar, sangat baik, bangunan masih baru, kebersihan kamar mandi OK. and location is perfect for may need that time. Food stores are available nearby the Hotel, within walking distance. Overall, great, I am happy and satisfy for that price, plus a free airport shuttle. If I travel again to Medan in future, for sure I will stay again on this hotel. thank you. If you have an early flight out of Medan this place is perfect, clean, comfortable and the staff were all smiles. Breakfirst, food selection should be more veriaties, not just fried rice ,noodle , sandwiches , soup..in 3 time stayed there the breakfirst food is the same..compared with veriaties of foods at Hotel Soechi in Medan for breakfirst. The rest of the facilities provided is very good, beware of the competitor opposite and accross the road, Prime Plaza Hotel Kuala Namu..
Well located near to airport without thinking of traffic jammed, good foods, peacefull area eventhough no shopping mall. Kfc nearby and Nasi Padang Sederhana restaurent. Lastly value for every dollars you paid. Thank you for choosing us as your stay destnation. Very clean. They allowed us to bring our bicycles into the room. 5 stars for that! Room had seating area with sofa and table. Spacious. Good eateries in the area. ATM in hotel. Enjoyed the stay very much. It is located near to Kuala Namu airport and they have a free airport to hotel shuttle van. You just need to book with them upon making hotel resrrvations. Upon leaving arrival area walk straight until the driveway and turn left where you could find the hotel shuttle van at the outer lane. Check in was smooth and room size was alright for a night stay. Within the hotel there are few restaurant and a KFC. There is a USB port to charge you mobile or gadget. TV selection for a 3 star hotel is considered good and of course local channel as well. Wifi somehow a bit weak at times during the day still manageable. There are at least 3 ATM machines at hotel lobby. And if you need to have a decent food, go to the lobby where there is a local and international cuisine resto called Papa Rich. They have great food and prices is resonable. Will stay there again as my 1st choice if need a hotel near airport. Location is about 1hr away from the city but it’s very near to the Kualanamu International Airport and free shuttle service to the airport. Lack of amenities around. Hotel room looked clean but bed blankets aren’t very clean with some stain marks. There are cafes, small provision shop and bakery shop around the vicinity. Clean, close to the airport, friendly service, definitely for this (low) price a great deal. The room is nice and spacious, the staffs are kind, and the breakfast is also the reason when you are here. Room is spacious & clean, bed and pillow is comfortable. It is like a studio unit with fridge. Hotel provides free shuttle to airport, which is about 10 minutes away. Buffet breakfast is not bad too. Very good hotels. It has gym, airport transfer and a really nice PappaRich restaurant. The only drawback is that wifi is sometimes unreliable to nonexistent. Has to work on it.